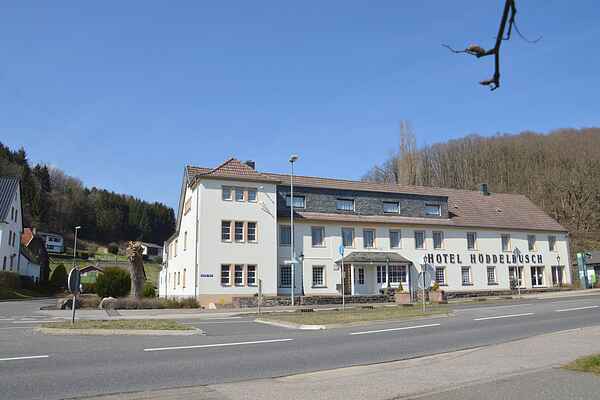 Are you looking for a large home for a weekend with family or friends in the Eifel mountains? Do you need plenty of room for everyone? This group holiday home is a great choice. Since this was once a hotel, most of the bedrooms have their own bathroom with shower, toilet, and sink. There is a large bedroom for 8 people (great for kids) with a communal shower area. On the ground floor, there is a bar with a seating area, a large dining hall, and a recreation room with billiards, table football, and a TV area. There are plenty of free parking spaces on the exterior property. Schleiden is a charming, lively town in the northern Eifel, where there is a number of shops and restaurants. Eifel National Park is 5 minutes away: it is a protected, 110-km2 natural area, where you can hike, bike, and go horseback riding for as long as you like. Hellenthal Game Reserve is 5 minutes away as well and puts on an eagle showcase 2 times a day. Rohren Sports Centre is 15 minutes away: during the summer, there is a 1250m luge track and in the winter, there is plenty of skiing and snowboarding to be done. The Rur Reservoir is 15 minutes away, where there are plenty of water sports and you can take a variety of boat tours between the spectacular mountains. The town of Monschau, typical of the region, is located 20 minutes away.